The Eagles are on the board in 2015, thanks in large part to defense, special teams and an improved running game (plus an assist from Brandon Marshall’s “historically” boneheaded play). But one major question remains unanswered: What do they have in Sam Bradford? After his team’s 24-17 victory over the Jets on Sunday, Eagles Pro Bowl left tackle Jason Peters was quoted as saying “A win’s a win.” He’s right. Wins are hard to come by in the NFL, particularly when you’re 0-2 and on the road facing the league’s hottest defense. Each victory deserves to be honored and cherished. But we all know why Peters felt compelled to even utter the timeworn adage. Many of the concerns about Philadelphia’s offense coming into the game—particularly those about new quarterback Sam Bradford—remained on the table coming out. In the second quarter on Sunday, on the first play from scrimmage following a Philadelphia touchdown, Jets receiver Brandon Marshall caught a 15-yard pass and, inexplicably, tried to lateral to teammate Jeff Cumberland in traffic while being dragged down. Instead, the ball caromed off linebacker Connor Barwin’s facemask and was scooped up by Philadelphia. (Marshall would later call it “the worst play in NFL history.”) The Eagles reached the end zone seven plays later to stretch their lead to 24-0. 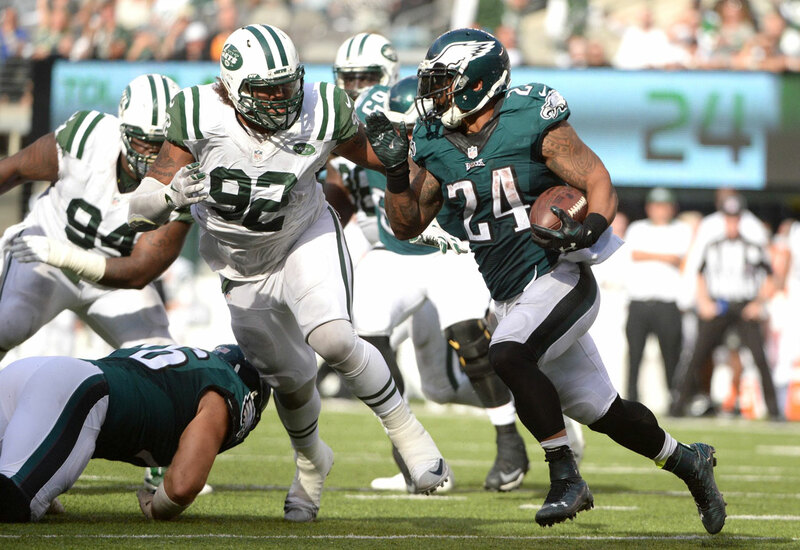 Earlier, Darren Sproles had taken a punt back 89 yards to give Philly its first touchdown. Take out those two aberrational plays and you notice that the Eagles’ reeling offense scored just 10 points that were fully its own, averaging a meager 3.4 yards per play. (By comparison, Philly averaged 4.1 in the disastrous Week 2 loss to Dallas). Fortunately, even when Marshall wasn’t handing them the ball, the Eagles’ defense was stellar, particularly on the back end, where they thrived in their staple matchup zone coverages and consistently won battles in man-to-man. And against all reasonable assumptions entering the game, the Eagles’ rushing attack was productive against a normally voracious Jets defensive front. With DeMarco Murray in “civvies” (as Al Michaels would say) nursing a hamstring injury, Ryan Mathews got 25 totes, amassing 108 yards. Much of that was on off-tackle concepts that highlighted Mathews’ ability to smoothly transition between lateral and downhill movement. It was a refreshing contrasts from the hesitant running that Murray had displayed in Weeks 1 and 2, and it raises questions about which style of back is a better fit for this up-tempo offense moving forward. That can be answered as the season progresses. More pressing are the questions that remain concerning Bradford. Against the Cowboys, the sixth-year QB routinely failed to diagnose coverages quickly enough. The Cowboys were shrewd in a lot of their zone disguises, and when they went man-to-man—which was early and often—they played with suffocating discipline. Still, Dallas presented nothing that an NFL quarterback shouldn’t expect to see every week. Bradford did not swiftly identify the concepts and, consequently, failed to process how his team’s route designs interacted with what he was seeing. He left a handful of throws on the field. And on many of the throws he did make, his timing—and therefore ball location—was off. On Sunday, the Eagles had a clearer plan for facing a Jets D that boasts better defensive backs than Dallas’s. 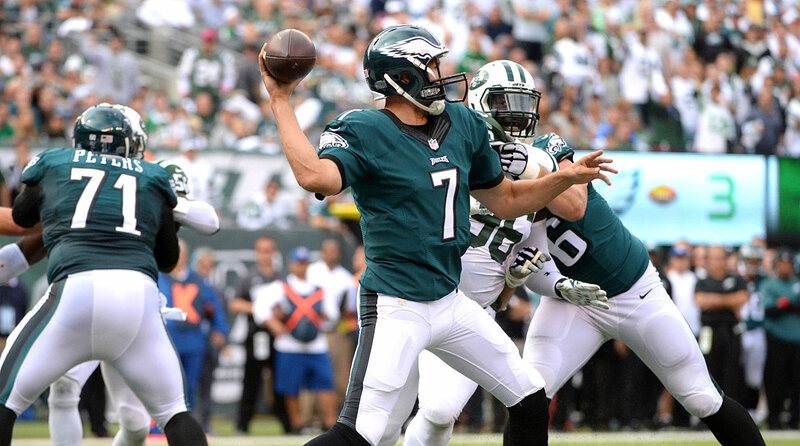 Philly relied heavily on wheel routes to create leverage against New York’s man defenders. On a wheel route, the receiver begins his pattern running towards the sideline and then loops upfield once he gets outside the numbers. Because of this geometry, 99% of wheel routes derive from either the slot or backfield. Philly’s were no exception. On his 23-yard touchdown catch, Mathews came from an offset running back alignment. On an 18-yard pass interference against corner Buster Skrine, receiver Jordan Matthews came out of the slot. There were a handful of other critical wheel routes, and the damage could have been more severe if not for the occasional drop or misfire. The beauty of this tactic was that, by involving the running back or slot receiver, the Eagles exploited a linebacker, safety or, at times, the slot corner. In other words, they avoided challenging Antonio Cromartie and Darrelle Revis—something Philly’s wide receivers did not do with sustained success on their own. The tactic also defined the reads for Bradford. Many wheel routes have an either/or element to them. With the wheel being an obvious, slow-developing route, if it’s not open then the next read is often a checkdown on the same side of the field. There’s a simplicity to all this, very similar to the simplicity that comes from play-action, which is another half-field read concept. The question is: Did Chip Kelly feature the wheel to get his overmatched receivers in winnable one-on-one situations? Or was it to help make his quarterback comfortable? The answer is almost always “a combination of both,” but in this case it must be closely weighed because the Eagles will not be able to make their living each week just on wheel routes and off-tackle runs. Kelly’s offense is simplistic in design but complex in the way it’s presented. Broken down into its main components, the system is a collection of crossing patterns and seam routes that are intertwined in different ways and take place out of various formations. With such a simple scheme, the only reason a quarterback would not target receivers at the intermediate ranges is if he’s not comfortable with what he’s seeing. On Sunday, Bradford again benefited from superb pass protection, yet he rarely targeted the seams or between the numbers. That must be addressed. Maybe this is part of the rust that’s still flaking off Bradford after he missed essentially the past year and a half due to ACL injuries. Then again, before those injuries there were hints of these same concerns. The Rams tweaked their system to accommodate this. The Eagles won’t be able to tweak much further than they did on Sunday. Week 4 presents a great opportunity for this passing game to get on track. Philly faces a Washington defense that, through three weeks, has been schematically predictable. Unless it’s third-and-medium-or-less, new defensive coordinator Joe Barry has generally employed a straight three-over, four-under zone. (Or that’s how the coverages have ended up, anyway.) Early in the down, they’ve been disguised as other things, and a big part of the coverages are the built-in rotations defenders take in unraveling their disguises. Bradford must get a handle on those rotations and project where moving bodies are going. Whether he does or not will be the most revealing indication yet of what Chip Kelly really has in his new quarterback.